It’s not been the smoothest of starts to Stuart Mellish’s tenure at Shawbridge by any stretch of the imagination. The former Warrington Town boss, who took over the reins from Simon Haworth in the Ribble Valley, is still awaiting his first competitive victory with the Blues as the curtains closed on a largely forgetful August. Mellish, who won the title with the Yellows at this level, looks like he may have a job on his hands in attempting to reverse Clitheroe’s current form, with surgery seeming necessary on a defence that is shipping goals far too often. They’ve leaked 17 goals in four fixtures so far with six of those coming in the FA Cup tie against Sunderland RCA as the Northern League Division One side forced a reply in an unpredictable 12-goal thriller. The home side had held a 4-0 lead early in the second half and were 6-4 up in the second minute of time added on. However, having been reduced to nine men, they somehow managed to let that lead slip in the final seconds. Obi Anoruo put the posts ahead in the 10th minute after being played in to the penalty area by skipper David Thompson before striker Oli Wood converted from the penalty spot in the 18th minute with Antoine Recizac being hacked down in the box. Clitheroe were in the groove, showing clear signs of their capabilities, and Josh Gregory drove home the third on the half-hour mark. Anoruo netted his second inside a minute after the break, courtesy of Recizac’s assist, though Luke Page got a goal back almost immediately. Dominic Moan jumped on the loose ball in the 50th minute and fired past Ed Wilczynski to reduce the deficit once more but Anoruo completed his hat-trick in the 54th minute to give the hosts some breathing space. With more than half-an-hour still remaining, though, there were still plenty of twists and turns to come and Jonathan Davis tucked away a penalty to make it 5-3 once Jason Jeffries had conceded the kick. Michael Charlton forced a nervy finish when finding the back with 12 minutes remaining and within 60 seconds the home side were down to nine men. Substitute Declan Daniels was the first to be given his marching orders for a two-footed lunge and Thompson followed when receiving a second yellow in the ensuing fracas. With Clitheroe hanging on, Recizac appeared to have settled the game against the run of play when finishing off a wonderful counter attack. But that wasn’t the case. Page scored his second deep in to time added on and then Nathan O’Neill made it 6-6 to force the replay. Meanwhile, Clitheroe are propping up the Evo-Stik West Division table after losing their third game on the bounce on Bank Holiday Monday. The Blues are one of four teams not to have picked up a point yet but are rooted to the foot on goal difference after the loss to Kendal Town. Wood gave Clitheroe the lead from the penalty spot in the sixth minute, beating Stuart Dixon after being hauled down by the goalkeeper. 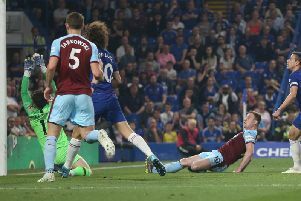 Robert Bowman fired the first warning shot midway through the first half when clipping the ball over the crossbar following Wilczynski’s poor clearance. Steven Yawson pulled the away side level after half-an-hour when getting alongside Thompson before drilling the ball in to the far corner. And two minutes later they had their noses in front when Wilczynski could only spill Sam Staunton-Turner’s attempt from distance in to his own net. Yawson then wrapped up the points after the break, jinking in and out of a number of players before firing home.